South Africa can use home advantage to go all the way and the lift the trophy when they host the 2013 Africa Cup of Nations, says ex-captain Neil Tovey. Tovey led Bafana Bafana to glory in the 1996 Nations Cup - the last time the tournament was held in South Africa. He recalled: "Everyone rallied behind the team 16 years ago, driving us on to some great victories and the trophy. "Playing at home can be a tremendous advantage. South Africa could go all the way again." However, South Africa's form going into the tournament, which will be played between 19 January and 10 February, has been less than impressive - they have won only twice in their last 10 matches. Gordon Igesund was appointed coach in June and he clearly has work to do to improve the the team, who are ranked as the 19th best team in Africa and are only among the top seeds for the Nations Cup because of their hosts status. Yet Tovey believes a good start to the tournament could turn their fortunes around. In 1996, South Africa walloped Cameroon 3-0 in the tournament opener and Tovey recalls it was a huge boost for a side that went on to defeat Tunisia 2-0 in a final watched by then-president Nelson Mandela. "Outplaying Cameroon set the tone for the tournament and gave us breathing space because we were in a difficult group with Angola and Egypt. "Getting those three points in the opening match meant we had an escape route if things went wrong in another group game. Luckily, we also beat the Angolans and qualified before losing to the Egyptians." 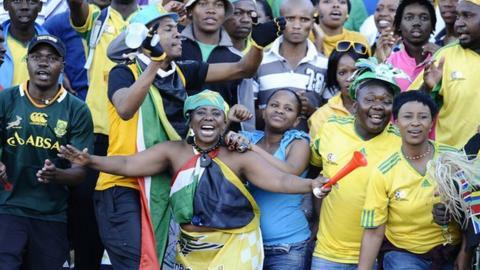 South Africa will find out who they will face when the draw takes place on Wednesday in Indian Ocean city Durban. They will do well to avoid the likes of second-seeded Nigeria, who are rated by Tovey as a major threat. "They possess an abundance of talent and my good friend Stephen Keshi is settling down nicely as coach and getting them well organised. He has so many good footballers to choose from. "However, Nigerian teams sometimes shoot themselves in the foot. They can be their own worst enemies. I do not see that occurring under Keshi, but they must learn from previous mistakes." Nigeria have been a hoodoo team for South Africa, and Igesund has confessed he is desperate to dodge the Super Eagles in the mini-league first stage. The 2013 line-up includes 10 Africa Cup-winning nations in Zambia, Algeria, Democratic Republic of Congo, Ethiopia, Ghana, Ivory Coast, Morocco, Nigeria, South Africa and Tunisia. Mali have been runners-up, Burkina Faso semi-finalists, Angola quarter-finalists, Niger and Togo have never gone beyond the first round, and Cape Verde Islands are competing for the first time.